Falling is something that, unless you are a stunt man, is not very fun. It is also something that most people have done many times, but as you become older the risk of a fall and its effects on your health generally increase. This is because, with age, the bones often become more brittle and a person’s sense of balance decreases. This can make it much more difficult to catch yourself as you fall and means that the risk of a serious injury is increased. Falls happen to everyone. No doubt when you were first learning to walk, you fell on a regular basis. As a child and young adult, the number of falls usually decrease and when you do fall, it is a simple matter to catch yourself. However, as we age, our reflexes are not so quick and our body not so resilient, so it is imperative to prevent falls. Many times, often due to cognitive disorders like Alzheimer’s, the likelihood of a fall will increase with age, but this is not always the case and with proper measures the chance of a fall can actually be decreased. For seniors, falls often result in hospitalization or fractures. One of the reasons that so many senior falls result in a broken bone is because many seniors suffer from osteoporosis. Osteoporosis is a disorder that results in weaker bones, which are brittle and prone to breaking. Many times even just a small low impact fall will result in a broken bone for people that have osteoporosis. Osteoporosis is caused by several factors, including a vitamin D deficiency, calcium deficiency, and less physical activity. It is common in both men and women, but it is much more common in women after menopause. There are several medicine available that can help combat osteoporosis, but they should only be used as a last resort. Instead maintaining a proper diet should be the first line of defense against osteoporosis. Taking calcium supplements or consuming foods high in calcium, like milk, is important. Usually a daily intake of 1500 mg of Calcium is recommended. It is also necessary to make sure you are getting enough Vitamin D. Vitamin D is formed naturally when the body is exposed to sunlight, so spending some time outdoors is a good idea. Taking vitamins high in Vitamin D is also a good idea. One of the most important steps you can take is to maintain a regular exercise regime. It is not necessary to go to the gym for five hours a day, but regularly performing lite exercise is important. It is a good idea to perform exercises that improve your balance, like Tai Chi, but some load bearing exercise should be performed as well. Water exercises can also be very beneficial and many public pools offer a water aerobic program specifically for seniors. Even just 15 minutes of regular exercise every other day can be very effective at preventing falls. Performing regular weight bearing exercise has also been shown to reduce the onset of osteoporosis. As we age, our eyesight often becomes poorer. This can be as a result of glaucoma or cataracts, which can make it harder to judge distances and negatively affect depth perception. This can make it more difficult to safely navigate around environmental factors. Usually it is easiest to make your home safe, so many falls happen away from the home in shopping areas. It is important to stay clear of curbs and other areas of different elevations. Using a rollator, which is a walker that has wheels in front, is a good idea, but canes and mobility scooters also reduce the chance of a fall. Around the home, the stairs present one of the biggest risks. Many times a stair lift or residential elevator is installed to allow the person to move up and down the stairs. It is also a good idea to use colored textured tape on the steps. This tape should be easy for you to see and be rough to the touch so that you can detect it easily. All areas of differing elevation should be marked with this tape, not just the stairs. The bathroom can also be very unforgiving, so bath mats should be used on the floor and grab bars should be installed in the bathroom. Several lifting aids are also available for the bathroom. Bath lifts are one commonly used lifting aid that lifts a person safely into and out of the bath tub. Toilet seat lifts are also common and are used to lift a person into a standing position. It is also important to regularly have your vision checked and keep your glasses clean. Many medical advances have been made in recent years that allow some diseases common to seniors to be treated using prescription medicine. This includes drugs that combat high blood pressure, osteoporosis, and reduce the effects of arthritis. Anti-depression medicines and muscle relaxers are also common. These medications, while very helpful, many times can impair a persons balance. 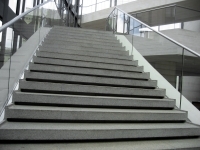 This unsteadiness can increase the risk of a fall and slow a persons response time. It is very important to understand what the medications do and their side effects. Have your doctor explain the medication, its uses, and its effects. Drinking alcohol and eating certain foods many times can amplify a drugs effect, so it is important to only drink in moderation. Stairs: The stairs are one of the most dangerous places for seniors. Falls on the stairs are the leading cause of death among seniors and frequently result in serous injury. Avoiding the stairs in public areas and having someone help you when this is not possible is very important. Around the home a stair lift can be installed, as can a residential elevator. The front steps can be particularity dangerous, because they are often made of brick or concrete. Bathroom: The bathroom is of particular danger. Most have many sharp edges and tile floors that become very slippery when wet. The floor should be covered in anti-slip mats and grab-bars installed around the bathroom. Grab-bars should also be installed in the bathtub and around the toilet. Kitchen: Like the bathroom, it is common for the floor of a kitchen to become wet, so using anti-slip mats is a good idea. Also many falls happen when using step stools to reach high cabinets. Investing in a good step-stool is important. Other Areas: Keeping your walking area clear of objects is important. This includes the stairs, but is true of all areas of your home. It is also a good idea to use easy to operate lights and motion sensor lights outdoors. Don’t use throw rugs and make sure that your carpet is well secured. Cleaning up spills and avoiding using wax or other slick cleaners on the floor is also important. Preventing falls is something that is very important. There are several types of medical equipment that can be used to prevent falls and there are also several steps that can be taken to reduce the risk of a fall. There are four basic steps that should be taken by people of all ages, but especially those over the age of sixty, who are not able to recover from a fall as easily as those that are younger.